Oh, look: something sweet. I had almost forgotten what that tastes like what with all of the savory that has been going on here. Hot weather not only makes me reluctant to turn on the stove, but also to do all of the general mixing and measuring and washing and digesting that goes along with sweets. That’s not the whole story, though. I’ve been SA-WAMPED at work, and when you barely have time to chew your food, you’re not even thinking about the luxury of dessert. I didn’t even have the time to stress bake. It was that serious. Luckily, I had an influx of zucchini and a hankering for a muffin, and it’s only in the low 70’s here, so we’re back in the baking game. 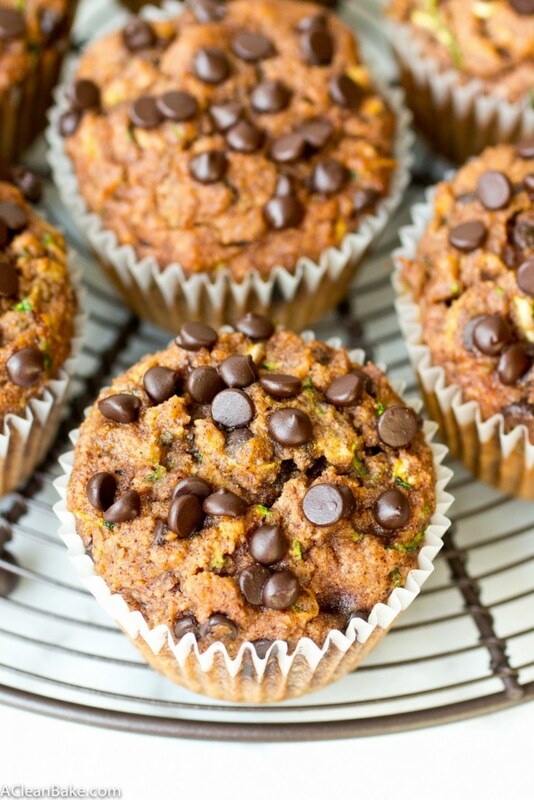 Plus: these zucchini muffins technically count as 26.4% side dish since they contain a serving(ish) of veggies in every one! Speaking of veggies and side dishes, if there is anything I have learned from your incredibly helpful responses to the quick one-question survey (look right!) it’s that so many of you are looking for quick and healthy recipes for family meals. I know most of you probably mean dinner, and I’ll be back with many more of those very soon. But in the meantime, this one is a perfect breakfast option because it can be made ahead, it freezes really well, and it will keep you full for while. And don’t forget that serving of veggies! Preheat the oven to 350F. Line 10 compartments of a 12-cup muffin tin with papers and set aside. In a large mixing bowl, whisk together the flours, sweetener, baking soda, spices and salt and set aside. In a medium mixing bowl, whisk the eggs, then whisk in the almond milk, oil, vanilla, and vinegar. 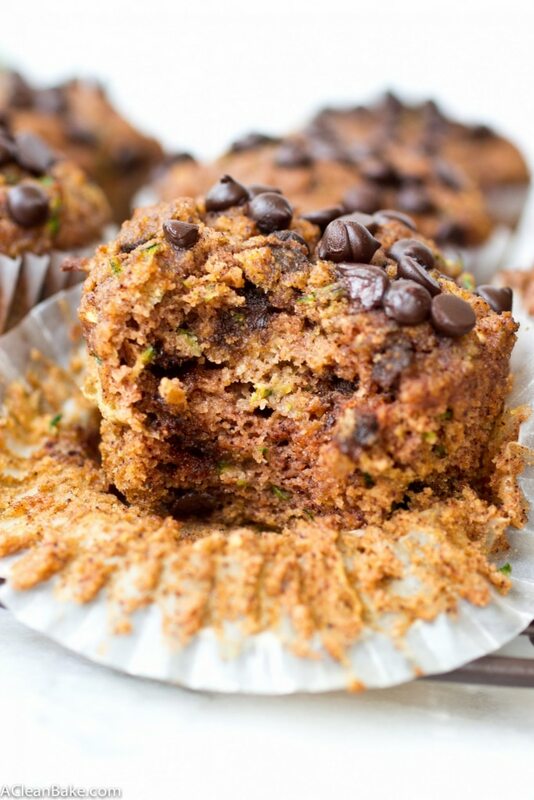 Fold in the shredded zucchini and mini chocolate chips. Use an ice cream scoop to portion the recipe into the 10 compartments of the prepared muffin tin and sprinkles the tops with more mini chocolate chips if desired. Bake for 20-22 minutes, or until a tester comes out clean. Thanks, Tara! I really love Norbu, the monk fruit sweetener I linked to in the recipe (though I have heard mixed reviews of other brands), and have found that it sweetens really well with no weird bitter aftertaste and is really gentle on my stomach. I no longer follow the low FODMAP diet religiously, but even when I was much more strict I never had a problem with it. I did some quick research and it looks like it is too new to the market for anyone to have a definitive answer on its FODMAP impact. But if you’re ok with granulated stevia, you might consider giving monk fruit a try as well! AH geez, sorry to hear things are so crazy busy at work. Hopefully they settle down and you have a chance to get in some good R&R! These muffins look like perfection! 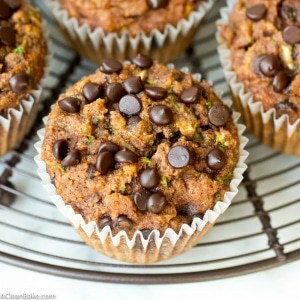 I’m all about zucchini bread and muffins, and those chocolate chips are making my face drool! These muffins look divine, Nora! Love the idea of adding zucchini! So good! I really almost took a bite out of my computer screen ;). These look so amazing! Nora, these look delicious! 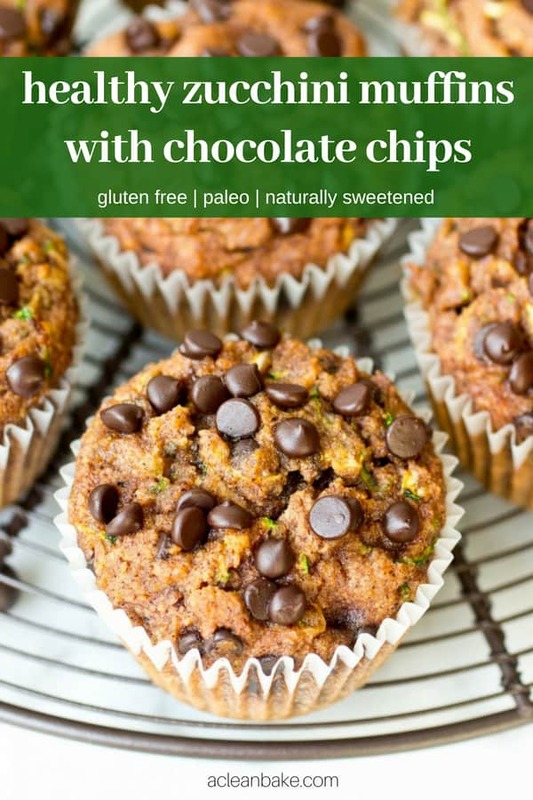 I love the abundant chocolate chips in these 🙂 Pinning! Thanks! Abundant chocolate chips are the only kind of chocolate chips 😉 Thanks for pinning! I don’t have tapioca flour. Could I use flaxseed meal, or just increase almond flour or coconut flour? You could try replacing the tapioca with half almond and half coconut flour, but I’m not sure what that will do to the texture of the muffins, so substitute at your own risk. The tapioca is what makes the muffins light and fluffy. If you can get your hands on tapioca flour/starch, or arrowroot powder, that would be much better. Me too! There’s nothing like a zucchini dessert to say abundance of veggies, which, in turn, says summer! Nothing like a good zucchini, chocolate muffin, Nora and these look over the top delicious! I can see how packed they are with zucchini! Love the close-up! I’ve not tried either of the sweeteners in your recipe… but I’m wondering how coconut sugar would do? Hooray for a little something sweet! Take it easy at work… perhaps things will calm a bit next week? I hope so! Have a restful weekend my dear! Totally! Don’t those two flavors just go together perfectly? You can definitely use coconut sugar. I would suggest using 1.5-2x the amount called for in the recipe since coconut sugar is not as sweet by volume as granulated stevia or monk fruit. Keep your fingers crossed for that slow down! 🙂 Hope you’re having a great week so far! These muffins look SO good! Nice and moist. A fair question!! I have heard from lots of readers that their first priority is getting dinner on the table and once that is taken care of, a healthy treat is a major bonus. Since lately I’ve been emphasizing entrees in my own kitchen, I’m happy that readers want to see the same thing! This looks delicious! the only trouble is that I’m a teacher who needs to adhere to nut free lunches because of anaphylactic students! Is there another flour I can use in place of almond flower? Hi Caitlin! Oh man, that makes things tough! I’m sorry to say that there isn’t a nut-free alternative that would easily substitute in for almond flour. I will keep that in mind though and see if I can come up with a nut free muffin recipe sometime! In the meantime, I’m sorry I can’t help! I can’t promise it will work but if you do try it, I’m curious to hear how it goes! These look so good! I love chocolate chip zucchini muffins. Do you have any advice on what the best egg replacement would be? I’ve had mixed results with things like applesauce or chia/flax eggs…they don’t always hold together well. Hi Ashley! I’ll be the first to admit that I am not an expert on egg replacements since we eat a lot of eggs in my house 🙂 But I would not recommend going the natural route – like chia egg or flax egg. And definitely not applesauce (way too much moisture!). Your best bet will, unfortunately, be one of the store bought egg replacement powders. I’ve heard very good things about Bob’s Red Mill brand, but I haven’t tried it myself. Sorry I can’t give you a more specific answer! If you’re looking for egg free recipes, you can click the egg free button in the right hand side bar near the top to see everything on my site that doesn’t contain eggs! This is the first gluten-free recipe I have made out of like 1500 that doesn’t taste absolutely disgusting and doesn’t fall apart when you try to eat it. I was about to give up on all of these alternative flours until TODAY! These taste SO good. I’m a sugar addict so I’m pretty excited right now! Win! Great recipe! I used 1/2c prune puree instead of munk fruit, and subbed 1/4c of the the starch for protein powder and they still turned out great. I don’t usually like anything with coconut flour, but these are yummy! My six year old picky eater asked for thirds. Win! I’m so happy to hear that!! Thanks for letting me know those substitutions work!